I have this thing for bridges. They tug at my heart as I stand near them and imagine their fine grand structure standing in the face of all kinds of weather. Daily they support cars crossing the river and inside each car is a person with a story if not many. All of a sudden I’m caught up by the strength of the bridge and in some strange way I’m full of hope. Bridges fascinate me; whether they are old or new they hold a purpose to take you somewhere. They are well thought out structures with concrete, steel and wooden beams. 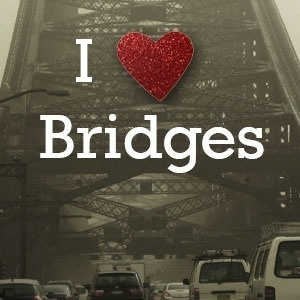 My nearest and dearest friends and family are like bridges. Their hearts go deeper than any structure, their wisdom is majestic then any weathered beam and they have this capacity to carry me in the good and bad times. They get better with age as they are the ultimate vintage. Like I am when I see a bridge so too is my heart full of hope when my friends come through and carry me over those rivers and valleys. Hope is found in friendship. They may take a long time to build and occasionally they get weathered, but the strong ones stick around and stand the test of time.